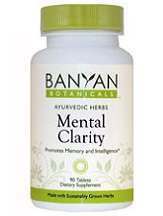 Basic Information: What are Banyan Botanicals Mental Clarity Tablets? This is a review for Banyan Botanicals Mental Clarity Tablets that will assist in the decision-making process when purchasing this product. This product supports excellent performance of the nervous system and the brain. It also has the ability to promote recall, memory, attention, focus. These mental clarity tablets also promote decisiveness and clarity. The primary ingredient is in this product is Brahmi leaf but contains a number of other effective ingredients. All of the ingredients are 100% organic and is suitable for vegans and vegetarians. Instructions are included with the product. It instructs the consumer to take 1-2 tablets once or twice a day or as directed by your doctor. It also states to use care with pregnancy. When the user takes their tablets they should drink it with a full glass of water. The label instructs users not to take more than is instructed on the label or their doctor. Mental Clarity can be purchased in 500mg tablets with 90 tablets per bottle for $19.95. If the consumer purchases a four or more bottles they can be purchased for $17.96 each. If the consumer wishes to purchase Mental Clarity in bulk, it can be purchased in a case of 12 for $215.86. When taking two tablets of Mental Clarity a day for 2 weeks straight in place of my typical ADD medication, I noticed major changes in my concentration and focus. In the two weeks that I have taken it, there are not any side effects that I have noticed. If you are a pregnant woman then you should use caution when you take Mental Clarity. You should consult your doctor before taking. Before taking any new supplement, you should get a check-up to make sure you are in good health. Banyan Botanicals accepts returns for unused products. They ask that you contact their customer service department before you make a return. They provide a return address as well as a Return Merchandise Authorization number to put on the package so it can be processed and your money can be returned to your credit card. Banyan Botanicals’ Mental Clarity seems to be effective helping with mental performance, concentration, memory and various capacities of learning. According to the reviews, there are no side effects and can be taken by seniors, students, and other individuals who need additional help with memory. Before you can take this supplement you will need consult your doctor and get a check-up. You need to be in good physical health to take this product. You must follow the directions on the label or it could be dangerous to your health. If you are allergic to any of the herbs contained in this supplement you should not take it.